Whether or not you choose to take a guided tour, there are some definite must-sees on a visit to Hollywood. Some have been around for years while others have assumed a place in more recent history. The Hollywood Walk of Fame - Step onto the sidewalk anywhere on famed Hollywood Boulevard and you'll certainly see a number of stars - the bronze ones on the sidewalk, that is. The Walk of Fame was inaugurated in 1960 when 2,500 blank stars were placed along the main thoroughfare. Since that time, more than 2,300 have been emblazoned with the names of famous personalities who've left their mark in the fields of radio, television, motion pictures, recording, and live performance. A small symbol on each star indicates for which field the person is being honored. The Hollywood Chamber of Commerce chooses the honorees each year after a long nomination process. Hundreds of nominations are made annually, but only a handful are chosen. Also, a celebrity can have more than one star on the Hollywood Walk of Fame. For example, old cowboy star Gene Autry has one star for each available category! When an honored celebrity dies, it's traditional to leave flowers or other mementos by his/her star. Grauman's Chinese Theatre - Opened in 1927, it's probably safe to say that this is the most famous movie theater in the world. Grauman's Chinese (now named TCL Chinese Theatre) has traditionally been the site of more Hollywood premieres than any other theater and, for several years, was also home to the Academy Awards ceremony. Most people can readily recognize TCL Chinese Theatre by its imposing exterior, which includes a huge red Chinese pagoda-like structure. Inside, however, you'll find much of the same including Chinese-style ornamentation and 2,200 bright red seats. Founder Sid Grauman was responsible for implementing the Walk of Fame and the stars on the sidewalk outside of his theater are reserved for the most notable celebrities. Walking tours of the interior of the theatre are about 30 minutes long, and can be purchased separately from movie admission. 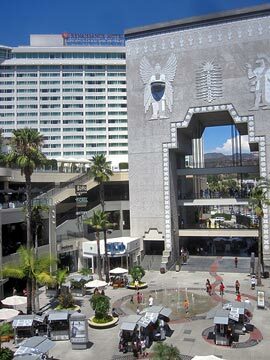 Hollywood & Highland Center - A tourist mecca, filled with entertainment, dining and shopping destinations. With more than 387,000 square feet of retail space, plenty of restaurants and eateries, a Loews Hotel, and the Dolby Theatre, Hollywood & Highland Center has something for everyone. There's ample (and inexpensive) parking for drivers, and it's right next door to the Metro station for riders, making this the ideal starting point for your visit to the Hollywood Entertainment district. The Hollywood Museum - Housed in the old Max Factor building, the Hollywood Museum is 4 floors full of wonderful movie memorabilia. You'll find a bit of everything here, from George of the Jungle's loincloth to silent film star Mary Pickford's blonde curls. The Dolby Theatre - This beautiful 3,400 seat theater opened in 2001 to much fanfare. It is now the venue for the annual Academy Awards. Situated in the middle of the Hollywood & Highland Center, the Dolby Theatre cost $94 million to build and boasts state-of-the-art everything! Truly, a guided tour of this fabulous performance venue is well worth the cost. Tours are available all year round, except for several weeks just prior to the Academy Awards ceremony. Madame Tussaud's - More than just a wax museum where you view life-sized models of your favorite actors, Madame Tussaud's is a showcase of celebrity wax figures where you can interact with the stars rather than just look at them! This attraction is situated in the Hollywood and Highland area, just steps away from most other attractions, and the Red Line train station. 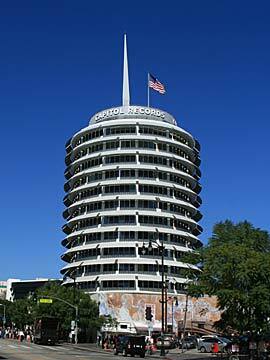 Capitol Records - located near Hollywood and Vine, it was the world's first round office building. The Walk of Fame stars for all four Beatles are located on Vine Street in front of the Capitol Records building. The Hollywood Sign - Sitting on the top of Mt. Lee, the highest peak in the Los Angeles area, the famous Hollywood Sign can be seen from many locations. Taking a photo of it is a must if you're visiting Hollywood. Many people don't realize that the sign originally read 'Hollywoodland,' and was actually a huge advertisement for a housing development in the area. The last 4 letters were removed in 1945. The Hollywood Bowl - Since its opening more than 70 years ago, this famous amphitheater has hosted the most amazing names in music of all genres. You can visit the Hollywood Bowl anytime of the day. You may find it empty or be lucky enough to catch a rehearsal. But for a true Hollywood experience, purchase tickets for one of the nighttime concerts. It shouldn't be too hard to get a seat. The Bowl holds 17,680 guests! The Hollywood Heritage Museum (across from Hollywood Bowl) is dedicated to the early days of filmmaking in Hollywood. 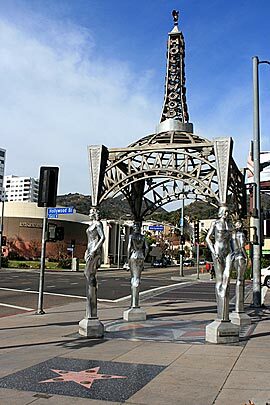 and tourist sites, including Sunset Strip, Santa Monica Boulevard, Hollywood's Rockwalk and more!